1986-1988, He served in the USSR Armed Forces. 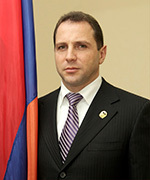 Since 1992, he has served in the Armed Forces of the Republic of Armenia. 1992-1994, he served in the system of the Ministry of Internal Affairs of the Republic of Armenia. 1994, he served as head of division at the Military Police Administration of the Ministry of Defense of the Republic of Armenia. 1997, he served at the Armaments Department of the Ministry of Defense of Republic of Armenia. Awards: 1st, 2nd degree medals and 2nd degree order For Services to Fatherland; 1st, 2nd and 3rd degree medals For Meritorious Service, Vazgen Sargsyan, Andranik Ozanyan medals.